NEW YORK CITY, May 11, 2017 – The global cycling marathon series, GFNY, continues to expand its brand in Latin America with the inaugural GFNY Costa Rica to be held on April 22, 2018. The adventure-packed, family-friendly town of La Fortuna will host riders and families. GFNY Costa Rica will provide an undulating course with several short but steep hills. Riders have the option between the competitive 150km long distance with 2714m of climbing or the non-competitive 92km medium distance with 1476m of climbing. The long distance serves a 2017-2018 qualifying race for the racer corral at the 2018 Campagnolo GFNY World Championship in NYC. Costa Rica’s tropical climate guarantees warm rain or hot sunshine throughout the course that will take riders alongside the majestic Arenal Volcano and Lake Arenal. Besides the stunning scenery while cycling, the host town, La Fortuna, and surrounding Arenal area offer a wide range of adventure activities like hiking, canopy tours, cave explorations to provide a memorable adventure trip for the whole family. 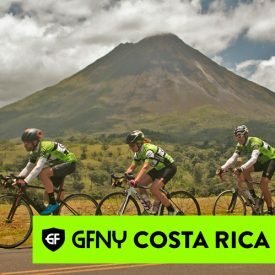 Registration is now open at gfnycostarica.com. GFNY is the global cycling marathon brand with events held in NYC, Argentina, Brazil, Chile, Colombia, Germany, France, Indonesia, Italy, Malaysia, Mexico and Uruguay.